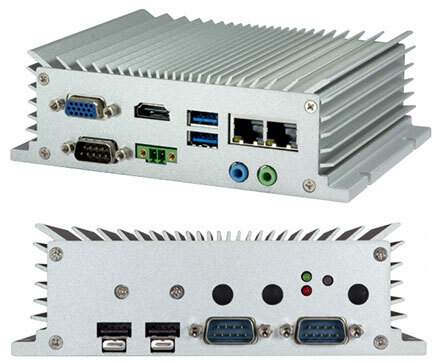 The VIA AMOS-3005 is a low power, ultra-compact fanless embedded solution with a ruggedized chassis supporting wide operating temperatures (-20°C to 60°C) and an input voltage range of 9V-36V that provides customers with a versatile and highly-reliable system for the most demanding embedded computing environments. Harnessing the high performance and low-power consumption of a 1.2GHz VIA Eden® X4 quad-core processor and VIA VX11H MSP including the VIA C-640 graphics processor with DX11 support for richer textures and 2D/3D displays, the VIA AMOS-3005 cleverly incorporates a rugged design with rich network connectivity in the form of dual Gigabit Ethernet (GLAN), and optional Wi-Fi, GPS, and 3G networking. The system integrates a wide array of I/O connectivity features, including one HDMI port, one VGA port, two USB 3.0 ports, two lockable USB 2.0 ports, 2 Gigiabit Ethernet ports, 2 COM ports, and one 9-pin D-Sub connector for 8-bit GPIO. Onboard I/O includes one mSATA connector, one SIM slot, and one miniPCIe slot. The system also supports up to 8GB DDR3 1333 SDRAM. The VIA AMOS-3005 is fully compatible with Microsoft® Windows® 10 IoT, Windows® 10, 8.1, 8, 7, Windows® Embedded Standard 7, and popular Linux distributions. Customers can take advantage of VIA’s industry leading hardware and software support, including the VIA Smart ETK (Embedded Tool Kit), which provides an application programming interface (API) that makes it easy for system developers to control and monitor GPIO, Watchdog Timer, Hardware Management, Flash and other functions. Wake On LAN (WOL) and pre-boot execution environment (PXE) are also supported, allowing the creation of a host of remotely managed IoT devices for the most demanding of environments. With its ruggedized design, rich networking connectivity options, and a host of extendable I/O options, the VIA AMOS-3005 is the ideal solution for a wide range of embedded IoT, and machine-to-machine applications.